For a long stretch of Stage 21, which started at a mellow pace under sunny skies, Lance Armstrong and Jan Ullrich rode side by side. Now, Lance has humbled a lot of people in his seven years of dominance, but no one has suffered more than Ullrich. Ullrich won the Tour in 1997 and looked like he might be a candidate to run off four, five, maybe even six in a row. In a 1998 Tour marred by a drug scandal, Ullrich came in second. He missed the race in 1999 with a knee injury and since then Lance has won every year while Ullrich has finished second, second, second, third, fourth, and this year third again. He has also been the victim of several of Lance’s most cold-blooded moments, including one known simply as “the Look,” where he came up from behind Ullrich on a climb, passed him, glanced back at him with withering equanimity, and took off like a rocket, leaving the German far behind. Despite all that, the two looked quite friendly today, engaging in what appeared to be a very pleasant conversation and even holding hands at one point. After that Lance made the rounds, exchanging greetings with a number of different riders, and team manager Johann Bruyneel showed up with the champagne. Things got more serious as the peloton approached Paris and the first real rain of this year’s Tour came down. There were a bunch of crashes, including one that could have been a major disaster. George Hincapie, Lance’s right-hand man, skidded on a curve and went down, taking out two other members of the Discovery Channel team. Lance himself was slightly behind the others and only had to put his foot down and change direction; but had things gone a little differently, he could have been injured. This served as a vivid reminder of the fact that in winning seven Tours, Lance has been incredibly lucky as well as incredibly good. It was still raining as the race moved onto the treacherous cobblestones of the Champs-Elysées for the first of the eight laps that conclude the Tour. Race officials had decided in advance that if it was raining, the Tour clock would be stopped after the first of the eight and the rest would count only for the stage win. So most of the riders played it safe for the last seven laps, but not Alexandre Vinokourov and Bradley McGee, who fought it out at the finish. Vinokourov turned out be just a little bit stronger and got the win. And just like that, it was finally over. Lance was immediately taken off to be drug-tested for the 18th time this week, and my assistants and I took advantage of the break in the action to do a couple victory laps around the living room to “The End of the Tour” by They Might Be Giants. I didn’t quite understand what I was getting myself into when I undertook this journey. There have been lots of ups and downs along the way, but now that it’s over, I feel as if I have completed my own personal Tour de France. In the famous words of the infamous J.R. Rider, I said I was going to do it and I did it; I have to love myself for that. The ceremonial champagne awaits, and then perhaps a nap. There are just a couple orders of business to clear up first. I’d like to thank Mom and Dad for making me possible. I’d like to thank the whole Vortex clan for their invaluable support. I’d like to thank Crispy Bacon, who generously provides server space and tech support for this monkey-brained writer, as well as several others I could mention. I’d like to thank Over Medium and Raw Meat Patrol, who watched the last stage with me while listening patiently to my ranting. I’d like to thank my several faithful readers, without whom I would be unread. 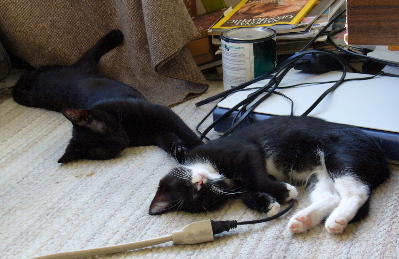 I’d like to thank the kittens for being so goddamn cute. And finally, I’d like to thank the Outdoor Life Network’s entire team of commentators—Al Trautwig, Phil Liggett, Paul Sherwen, and last but not least genial nutjob Bob Roll—for their knowledge, sense of humor, and unflagging enthusiasm. Even though it can be a little annoying when they insist that every single stage is among the most thrilling they’ve ever seen, they kept me going when things got rough. After spending an ungodly number of hours listening to them call the race, I feel like they are close personal friends. I may be in need of professional help. In the interest of full disclosure, I feel that I must take responsibility for the predictions I made at the beginning of the week. They didn’t go so great. I correctly picked the first, second, and third place finishers, but a woodpecker could have done that. I grossly overestimated Ivan Basso and Jan Ullrich’s ability to gain time on Lance; instead of making things closer through the week, they finished 4’40” and 6’21” behind, respectively. I picked Mickael Rasmussen in fourth place, but he ended up finishing seventh. I’m going to give myself a pass on this one, because there’s no way I could have known he would completely fall apart in Stage 20, crashing twice, including one where he literally flew over the handlebars, and changing bikes four times. At one point it looked like Rasmussen was going to just throw up his hands and quit, but he did eventually finish, losing almost eight minutes on the day. Fourth place ended up going to Francisco Mancebo. I had Levi Leipheimer in fifth place, and he was in fact in fifth place right up until the last minute of the Tour. But then there were some shenanigans. At first, we were told that there would be no time bonuses in the final stage; then somebody decided to award Alexandre Vinokourov a 20-second bonus for winning the stage, which was just enough to lift him over Leipheimer into fifth place. So I’m going to call that one a push. I picked the white jersey and polka dot jersey winners correctly, but those were gimmes. The only tough call was the green jersey, which I am pleased to note went to mighty Norwegian Thor Hushovd rather than my pick, jerkface Robbie McEwen. On the whole, I can’t claim to have made any prediction that was worth a damn. But this was only my third Tour, and my first as a self-proclaimed expert. I hope to do better next year. Which reminds me…. Finally, I’d like to ask anyone who’s been reading this epistle to leave me feedback in the form of a comment. Writing about the Tour has been a form of practice—I’m not sure for what exactly, but we’ll find out. So let me know what you liked and what could have been better. Peace, I’m out. This entry was posted	on Sunday, July 24th, 2005 at 2:51 pm	and is filed under Tour de France. You can follow any responses to this entry through the RSS 2.0 feed. You can leave a response, or trackback from your own site. I liked the whole dang thing. Next year: I’d like to see pictures of precious and johnny boy tethered to a lamb or a pig or dwarf cow or some other smallish farm animal, dressed up like cowboys. I would like your comment on the alleged new evidence of the old claim that Lance Armstrong was a blood doper. Boy that group L’Equipe really hates him.